Assigned 15 December, 2016 to Kosovo by ITU. +381 was previously used for fixed lines. Kosovo-licensed mobile-phone providers used +377 (Monaco) or +386 (Slovenia) instead. Kosovo (/ˈkɒsəvoʊ, ˈkoʊ-/; Albanian: Kosova [kɔsɔva]; Serbian Cyrillic: ) is a disputed territory and partially recognised state in Southeast Europe that declared independence from Serbia in February 2008 as the Republic of Kosovo (Albanian: Republika e Kosovës; Serbian: Република Косово / Republika Kosovo). Kosovo is landlocked in the central Balkan Peninsula. Its capital and largest city is Pristina. It is bordered by the Republic of Macedonia and Albania to the south, Montenegro to the west, and the uncontested territory of Serbia to the north and east. While Serbia recognises administration of the territory by Kosovo's elected government, it still continues to claim it as its own Autonomous Province of Kosovo and Metohija. In antiquity, the Dardanian Kingdom, and later the Roman province of Dardania was located in the region. In the Middle Ages, it was part of the Byzantine Empire, Bulgarian Empire and Serbia, and many consider the Battle of Kosovo of 1389 to be one of the defining moments in Serbian medieval history. After being part of the Ottoman Empire from the 15th to the early 20th century, in the late 19th century Kosovo became the centre of the Albanian independence movement with the League of Prizren. 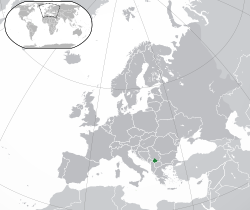 As a result of the defeat in the First Balkan War (1912–13), the Ottoman Empire ceded the Vilayet of Kosovo to the Balkan League; the Kingdom of Serbia took its larger part, while the Kingdom of Montenegro annexed the western part before both countries joined the Kingdom of Yugoslavia after World War I. After a period of Yugoslav unitarianism in the Kingdom, the post-World War II Yugoslav constitution established the Autonomous Province of Kosovo and Metohija within the Yugoslav constituent republic of Serbia. Long-term ethnic tensions between Kosovo's Albanian and Serb populations left the territory ethnically divided, resulting in inter-ethnic violence, culminating in the Kosovo War of 1998–99, part of the wider regional Yugoslav Wars. The war ended with a military intervention of NATO, which forced the Federal Republic of Yugoslavia to withdraw its troops from Kosovo, which became a UN protectorate under UNSCR 1244. On 17 February 2008 Kosovo's Parliament declared independence. It has since gained diplomatic recognition as a sovereign state by 110 UN member states and Taiwan. Serbia refuses to recognise Kosovo as a state, although with the Brussels Agreement of 2013 it has accepted the legitimacy of Kosovo institutions. Kosovo is classified as a lower-middle-income country which has experienced solid economic growth over the last decade by international financial institutions, and as one of only four countries in Europe to experience growth in every year since the onset of the global financial crisis in 2008.